Now is one of the best times to buy Alibaba stock. Alibaba Group Holding Ltd. (NYSE: BABA) stock has fallen 25% in 2015. Today, BABA hit its lowest value to date at $77.77. The company will announce quarterly and fiscal-year earnings on Thursday, May 7. 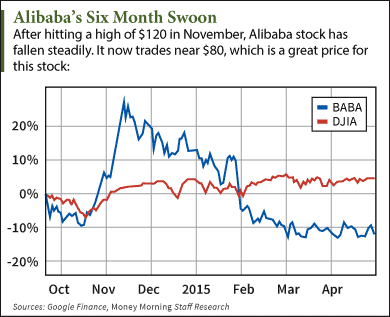 But this year's Alibaba stock price slump is not a bad sign for the long-term value of BABA. "For investors, an error of omission with Alibaba stock would be worrying about the short-term and missing the stock's long-term potential," Money Morning's Executive Editor Bill Patalon said. Alibaba is China's largest e-commerce company. In 2014, Alibaba's network of sites handled roughly 80% of all online transactions in the country. And the market is growing at an incredible rate. A recent study by the China Internet Network Information Center (CNNIC) determined the number of Internet users in the country will hit 800 million by 2016 or sooner. Alibaba has invested heavily in its mobile development. In February, it spent $590 million on a minority stake in the Chinese smartphone maker Meizu. Before that, Alibaba spent $1.9 billion on the mobile web developer UCWeb. It also dropped $215 million for a minority stake in the messaging app Tango. Those purchases have been paying off. Last quarter, Alibaba reported 265 million mobile monthly active users. That was a yearly increase of 95%. Gross merchandise volume (GMV) from mobile platforms increased 213%. Those numbers should continue to grow this quarter and for the next several years. Because more and more consumers are switching to mobile. According to the research firm Gartner, mobile payment transactions will grow by 35% annually through 2017. The global market for mobile payments will reach $721 billion by the end of 2017. In this week's quarterly earnings report, analysts predict revenue will grow 44% year over year. That's incredible growth for a company bringing in $2.8 billion per quarter. 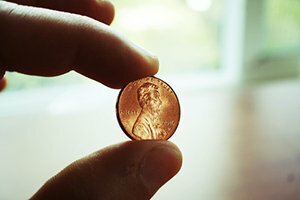 Earnings per share are expected to be $0.43 for the quarter and $2.19 for the year. The company had an operating margin of 37% in last quarter's report. 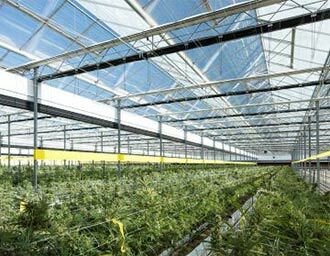 The company has more than $6 billion in operating cash flow, which gives it great flexibility for acquisitions. Alibaba's user base has been growing too. Last quarter it hit 334 million people. That compares to the entire U.S. population, which is just 319 million. That growing user base has lifted the company's gross merchandise volume (GMV). Last quarter, the company reported GMV growth of 49%. Alibaba's Chairman and Founder Jack Ma has plans to create a global juggernaut. "We want to be bigger than Wal-Mart," Ma told CNBC the day of the IPO. "We hope in 15 years people say this is a company like Microsoft, IBM, Wal-Mart; they changed, shaped the world." Ma quit his job as an English teacher to create Alibaba in 1999. Now the company is worth more than $200 billion. "This company has market power, a visionary leader, and it's making smart decisions," Money Morning's Patalon explained. "They're trying to build something special: a paradigm-shifting, rule-breaking company. They're trying to create new ways of doing things." Because of Alibaba's visionary leader and growth trajectory, Patalon thinks that Alibaba could become a $1 trillion company by 2020. That means investors who buy in now could see gains of 400% in the next five years. "What you have to look at is the long-term potential, which is still huge," Patalon said. "They still haven't even maxed out their own market. They're bringing in entertainment companies and new business-to-business ventures. They're going to keep expanding their offerings." The stock could remain volatile in the short term, but Patalon urges investors to look farther down the road with BABA stock. "This isn't just a stock to buy for 2015," he explained. "This is a great investment for years to come. If you invest money that you can afford to lose and hold on to the stock for several years, you'll end up being very surprised by how much you've made." The Bottom Line: Alibaba stock may be down in 2015, but this is one of the best long-term buys on the market. The company's market is growing extremely fast. It also has rock-solid financials and an innovative leader. We see Alibaba becoming a $1 trillion company by 2020. $BABA #Alibaba shares dip to their lowest value to date at $77.77. We're still bullish @moneymorning This is the best buy-in point yet. It is time to boycott this stock which feeds the Oppressive Chinese Government who will attack US in the end.. The hand that helped him get to the kind of business he had today. Boycott this stock before they get your very own people. China didn't know what to do with all the money they have from business given to them that they bite on anybody. A boycott here will actually save some lives.